The OB-8 is a clear recommendation for all who are looking for that characteristic – and up to now nearly unachievable – analog sound of the late 70s and early 80s. Today, classic analog poly-synthesizers clearly indicate that a major chapter in synthesizer evolution is now closing – slowly, but surely. The thing is: you can talk about classical vintage synthesizers, you can closely analyze their remarkable concepts and praise their unrivalled sound … but what’s that all good for if those objects of keen desire are no longer available? 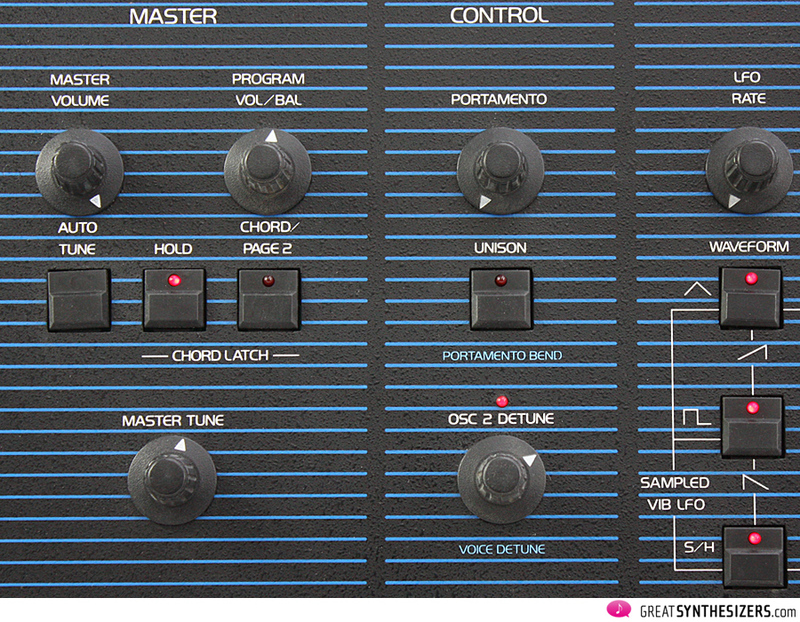 Most classic synthesizers have found a permanent home these days. Studios and collectors all around the globe are in the picture as to the musical and financial value of the instruments. No wonder classic synths are rarely sold nowadays! 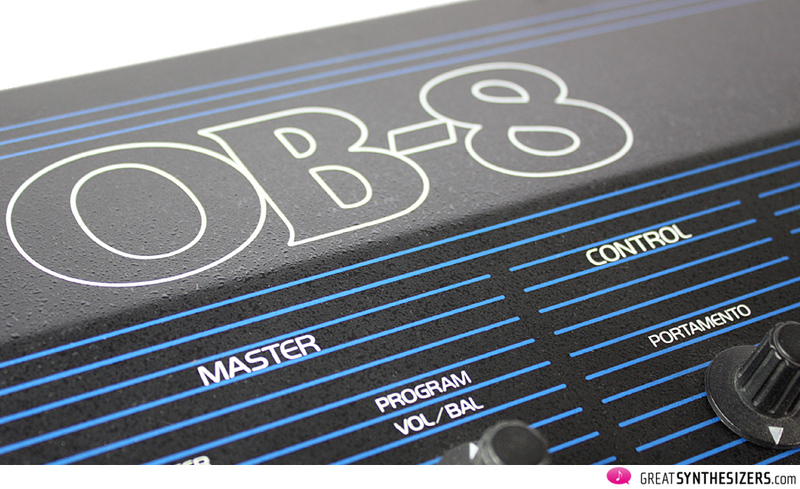 So … what about the Oberheim OB-8? Well, this classic still turns up with some regularity. And it’s still affordable. OB-8’s prices range somewhere between 4000 and 6000 Euros. 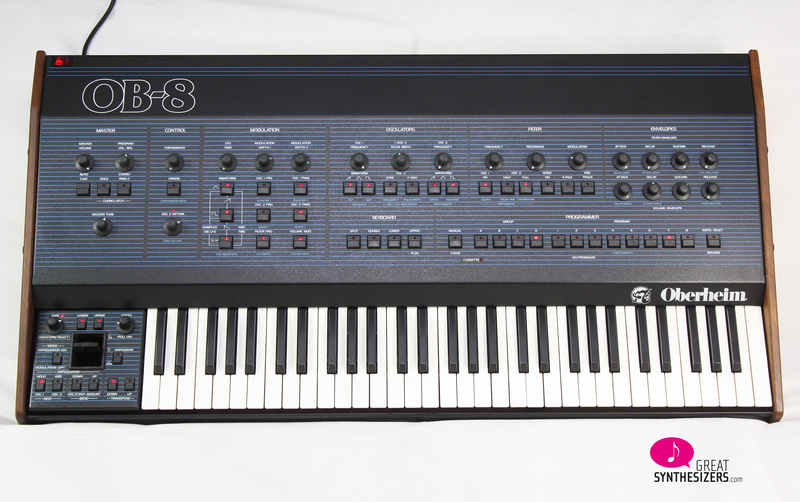 Almost by coincidence, this is also one of the best vintage Oberheim synthesizers – possibly one of the best vintage polyphonic synths ever built. 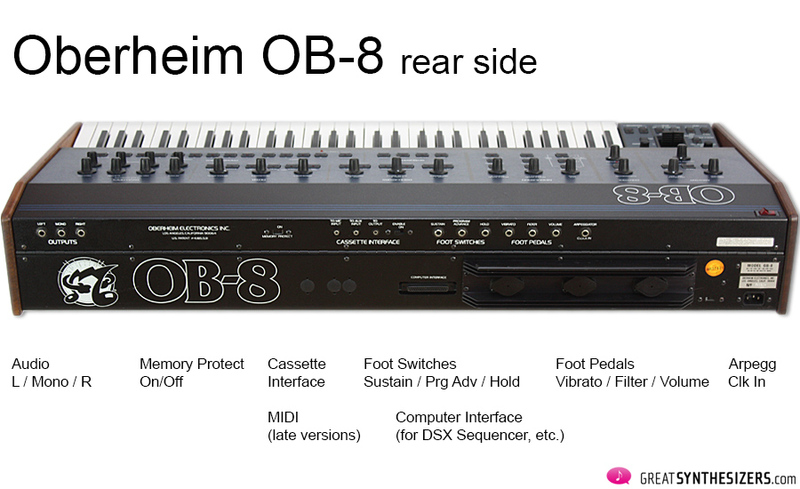 And although the new Oberheim (DSI) OB-6 is highly esteemed and – quite rightly – much praised, its sound is different. Seems as if the classic vintage vibe – a slow drifting sound full of beats – is impossible to copy. My personal story with the OB-8 begins with Juergen Haible. When I was paying him a visit at the turn of the millenium, Haible offered me a tour through his laboratory, his sacred hall of mysterious instruments. And there they were, those fabulous synth-clones that Haible had built himself: JH-720 / Korg MS-20 Clone, JH Synthi Clone, JH Midi Mini, the JH-3 modular system. 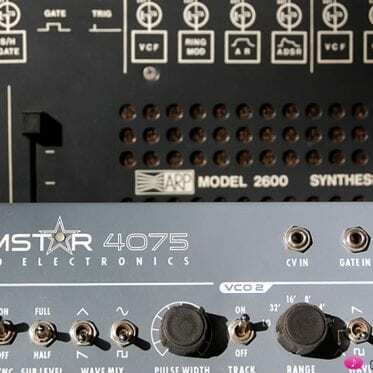 Along with other gems like the JH-3100 resonators, the JH HiFli / EMS Clone, a replica of the ARP Quadra phaser. 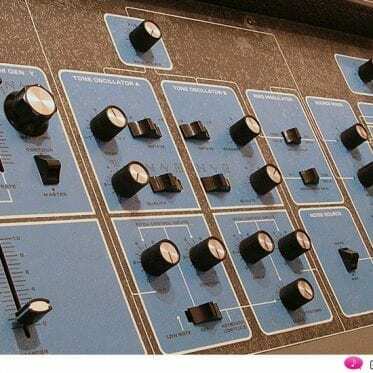 Alongside all DIY projects, for which Juergen Haible had gained worldwide fame, there were also some original classic synthesizers in his laboratory. Like the Yamaha CS-50. 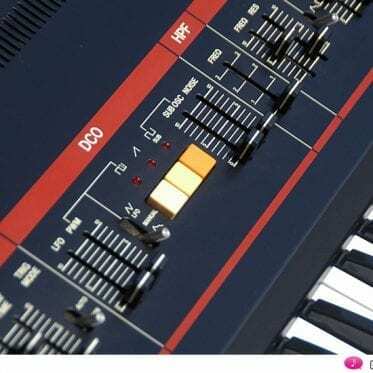 Or the Oberheim OB-8. 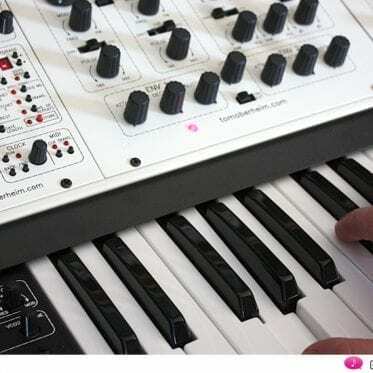 And Juergen Haible surprisedly avowed that THIS – the OB-8 – was his favorite Oberheim synthesizer. “I did not intend to buy an OB-8 when I was looking for a “real” analogue polysynth some years ago. When I was a student, I could only afford digital emulations of analogue sounds (on a Kawai K1 or Roland D50), or an analog/digital hybrid like the Ensoniq ESQ1. Then, when I got a job, I was looking for the “real thing”, and that was, by then, a Prophet-5. I kept those words secretly stored in my brain, until – by accident, and 10 years later – an OB-8 was offered for sale in a local town just around the corner. I bought it immediately. And it’s still in my studio. Today – another 10 years along the line – I have to admit: Juergen Haible was right. 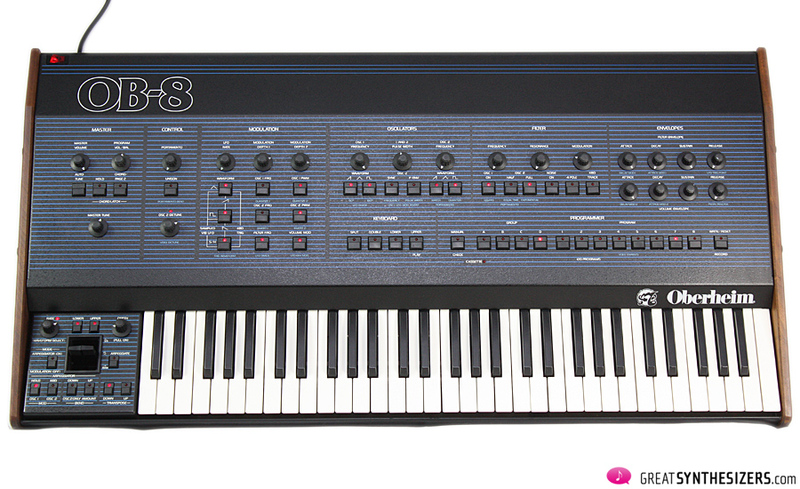 The OB-8 is one of the best (vintage) polyphonic synthesizers. Personally, I thinks it’s the peak of the polyphonic OB-Series, the cream of the crop. Since the OB-8 has DOUBLE / SPLIT mode, there are actually 3 (!) Low Frequency Oscillators (two Main LFOs and one Performance LFO). Pic. : Master-area with Portamento / Unison and VCO2/Unison Detune. Now, these features would seem to be quite ordinary. Nothing really special, right? However, an important part of the OB-8 lies tucked under its bonnet. This brings us back to those light blue labels – to all those glorious PAGE 2 functions. Keyword “tricky” software. Incidentally, there is another area of the OB-8 with double assignments. 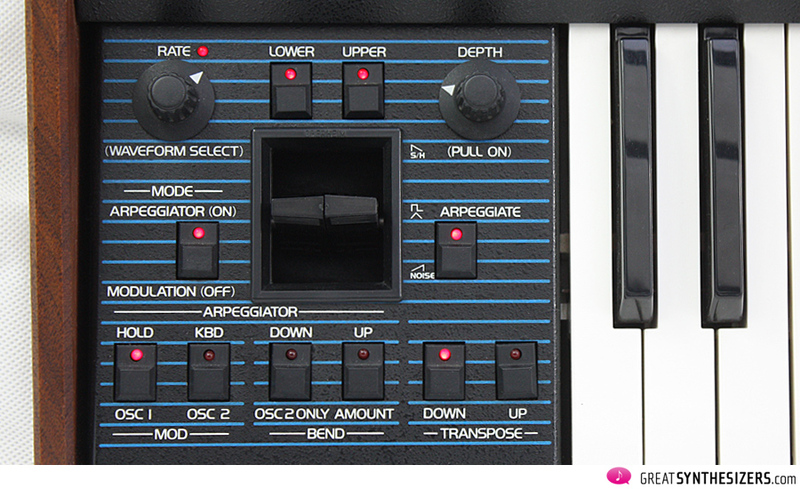 Pressing ARPEGGIATOR (ON) in the controller section turns most of those switches into dedicated arpeggiator controls. At some point, after reading the paragraph five or six times, you might get an idea of what’s going on here. But in the end, some double assignments and their functionality possibly remain a challenge. Nevertheless, PAGE 2 is a boon to the sound designer. A true “gem”. Factory MIDI is a blessing. I wrote that as a small rule of thumb in my diary. 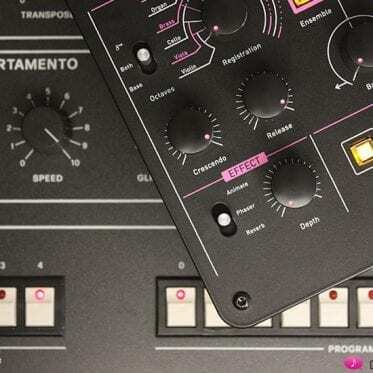 Sure: modern MIDI kits are “very” useful – Kenton Electronics and Encore Electronics offer excellent retrofit kits for many vintage polyphonic synthesizers. 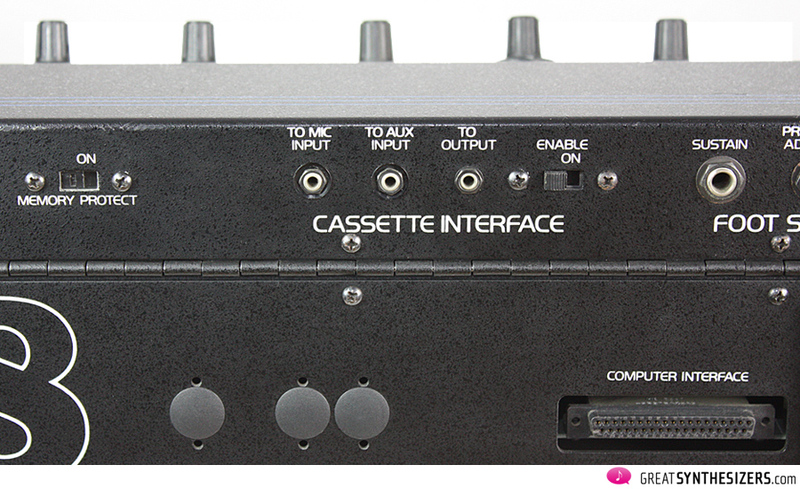 Nevertheless: If original factory MIDI is available, I would always tend towards that solution. Although the scope of performance may be pitifully low, factory MIDI creates a clear unity with the instrument. No modification is necessary, the system remains self-contained and – generally – stable. As expected, MIDI on the OB-8 is simply basic. NOTE ON/OFF, PROGRAM CHANGE and PITCH BEND/MOD WHEEL data is sent / recognized. In addition, sounds can be sent via MIDI dump from one OB-8 to another. “Sound per sound”, one after the other … I’d assume roughly 120 sounds in ten minutes. 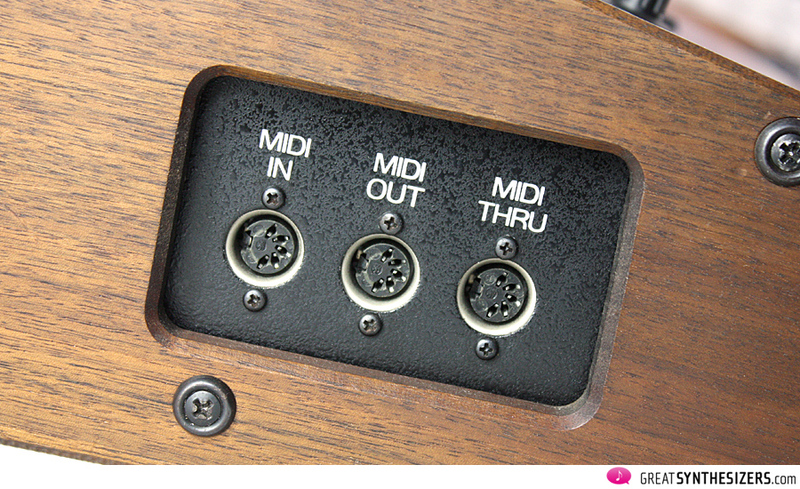 And of course you have access to the desired MIDI channel. And that’s it. Admittedly, technical details can be boring. Of course an Oberheim synthesizer from the early 80’s has 2 VCOs per voice and connectors here and there. So let’s get on to the music. How does the OB-8 sound? Creamy and absolutely brilliant. More specifically: a fantastic 8 voices with lively beats that constantly change direction in the stereo panorama (assuming the PAN potentiometers have been accordingly set). 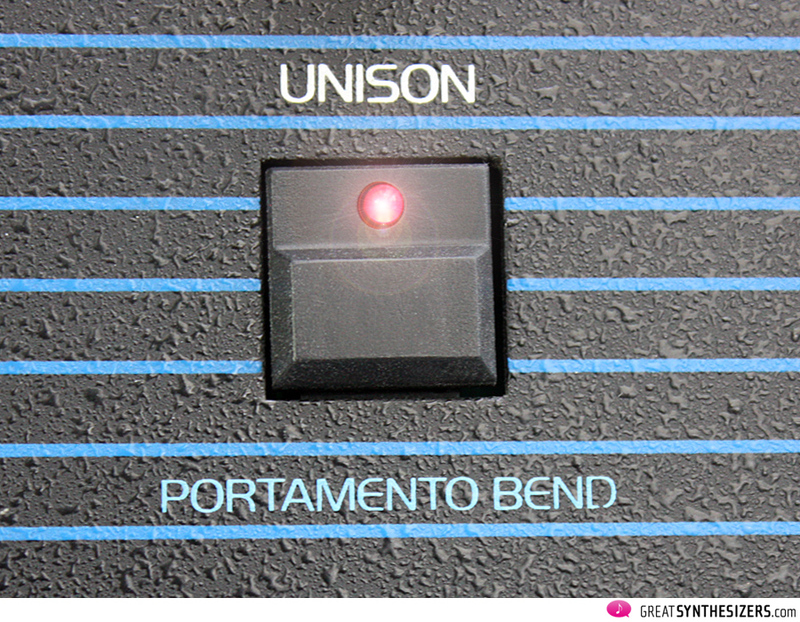 Luxurious sound carpets, poly portamento shifts and filter sweeps – permanent cinema-sound feeling in the studio. 16-VCO-unison-lead solos – overwhelming! A few quick impressions thus far. 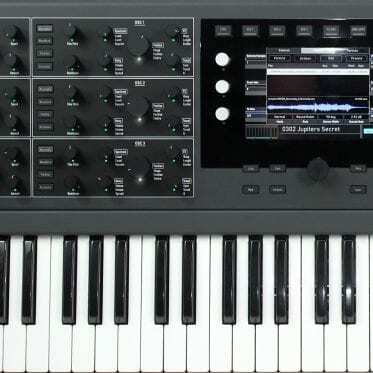 The OB-8 distiguishes itself from some of its competitors because: It has 8 voices (Sequential Prophet 5: 5 voices, Moog Memoyrmoog: 6 voices) and it sounds – especially in contrast to the Roland Jupiter-8 – alive and expansive, “without” the necessity of activating DOUBLE mode. In plain text: for pad sounds of all kinds, OB-8 offers the most warmth of sound of most vintage polyphonic synthesizer (next to its brothers OB-X / OB-Xa, and possibly next to the Rhodes Chroma), even topping the new Oberheim (DSI) OB-6. On the other hand, OB-8 does have a problem with its envelopes, which tend to be a little bit sluggish. Short, percussive sounds are not one of the instrument’s strengths. In this one case, Prophet-5, Memorymoog and Jupiter-8 are a lot snappier. Back to the positive: some aspects of sound design are unique in the OB-8. Phase distorted LFO modulations for further amplification of audio pan? No problem. A quarter turn (90°), a half turn (180°)? You have the choice. Unison detuning adjustment, from already massive to outrageously massive sounds? One turn – done! Increasing LFO speed according to the keyboard? Just activate LFO TRACK – and you’re done. All this is fishing in that ominous PAGE 2 pond. It’s the software that makes the difference! Granted, the OB-8 is not the best synth for effect sounds. 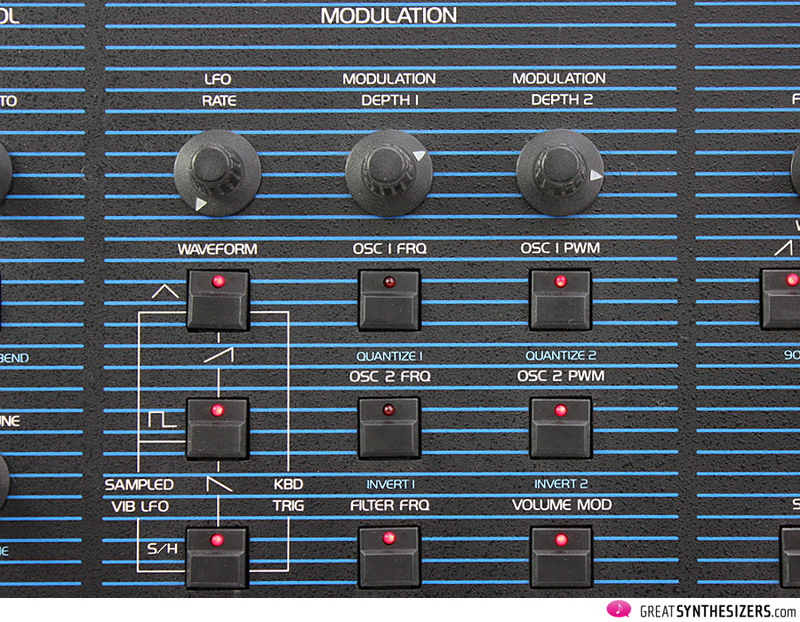 Its modulation routings are “ok”, but not at all special. Once more, Memorymoog, Prophet-5 and Rhodes Chroma get more points here. 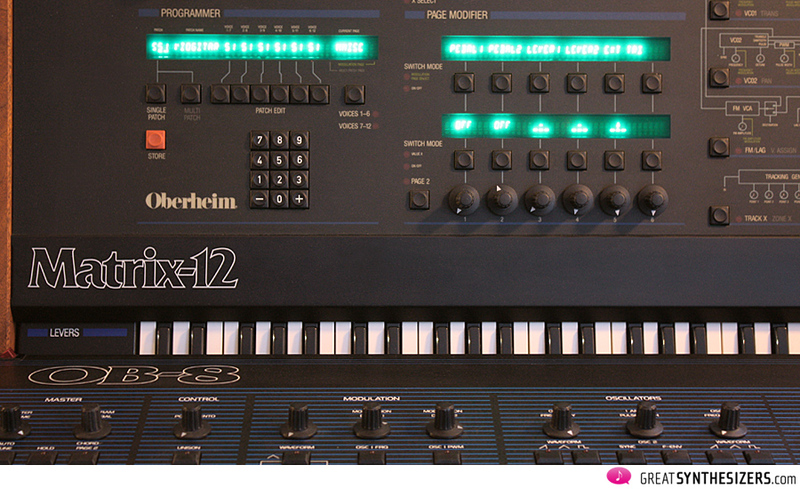 To say nothing of Oberheim Xpander and Matrix-12, with their powerful software. 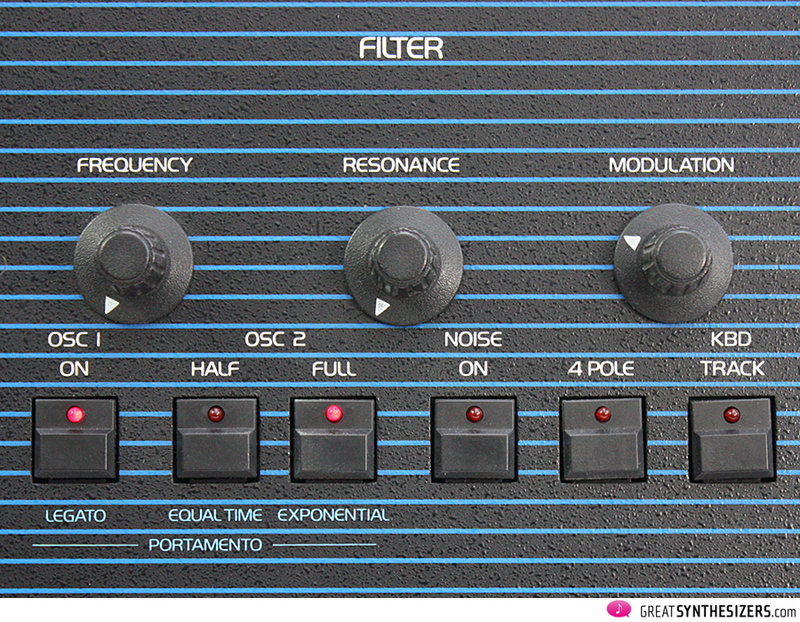 Admittedly, the OB-8 sound is a clear step below OB-X / Xa. 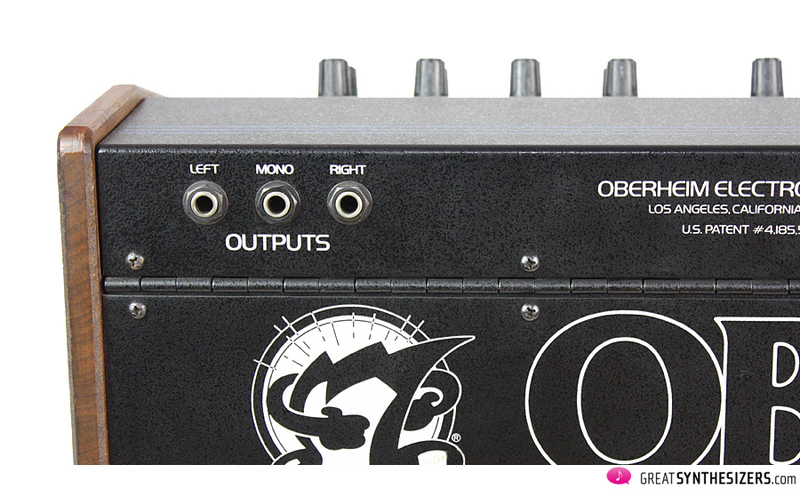 But Juergen Haible developed some (quite simple) modifications to bring the OB-8 up to OB-Xa standard. The capacitor-mod in the VCF-VCA area, for instance. Or an increase in the final VCA audio quality (… here’s another link). Capacitor-mod and/or audio-mod lend the OB-8 more bass and a fundamentally stronger audio signal and – if I’m right – in filter self oscillation. Further Haible upgrades: MultiMode VCF Modification and Poly Modulation (audio-rate filter modulation by VCO 2 … ). A few surprises. First: Weight. Despite its massive size (103 x 52 x 16 cm), the OB-8 weighs a mere 17 kg. Even in a flight case, it’s quite comfortable to carry around. 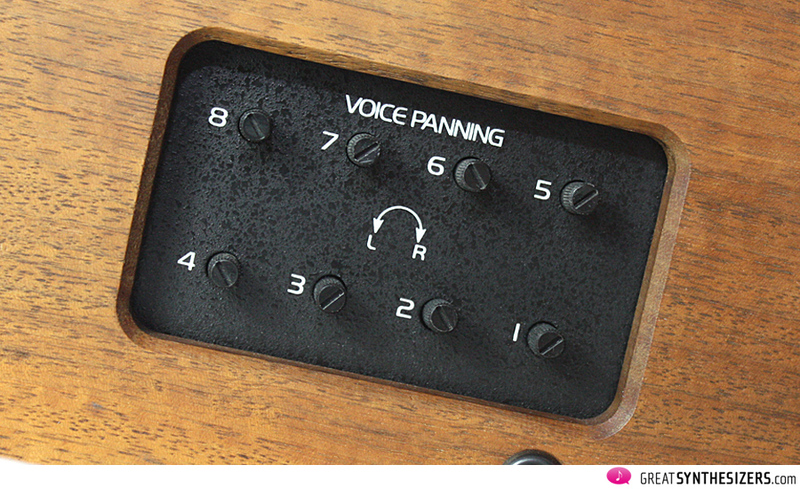 Next: Those two handy recesses in the wooden side panels. One for voice panning, one for MIDI. 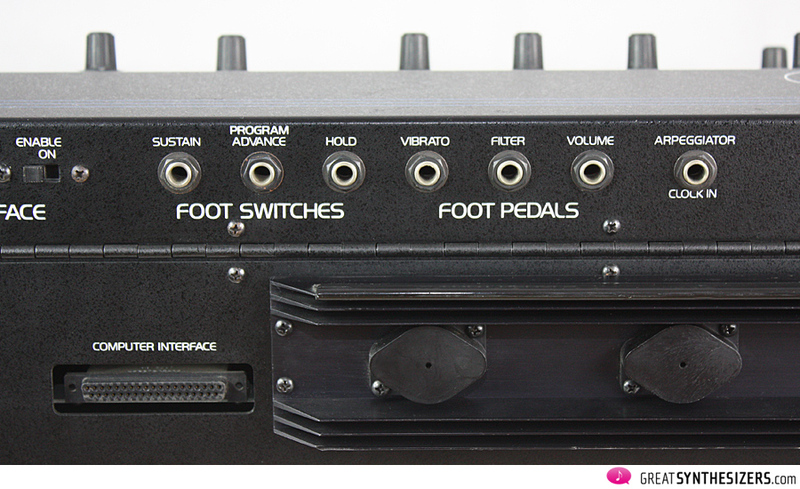 Not exactly a surprise, but a true sensation: that luxurious OB-8 user panel. Such a clear layout with large knobs and lots of space is definitely a sensation. Pure luxury. Looking for that earth-shattering, lively and meaty vintage sound of the late 70s / early 80s? 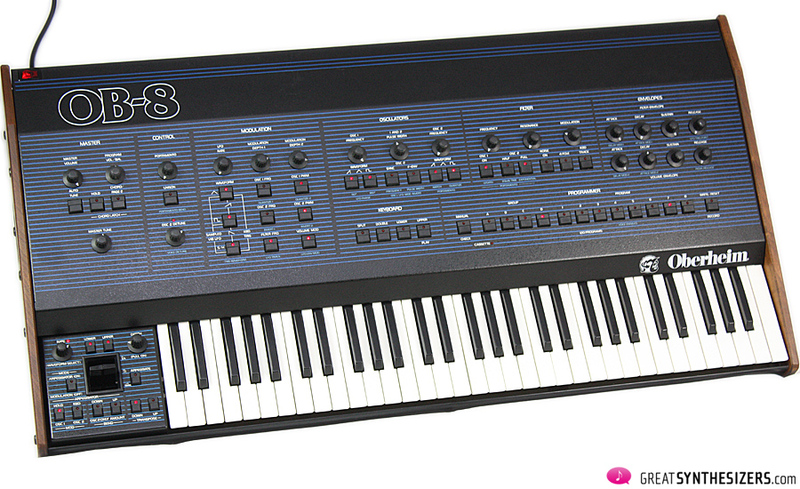 Keep an eye out for an Oberheim OB-8. 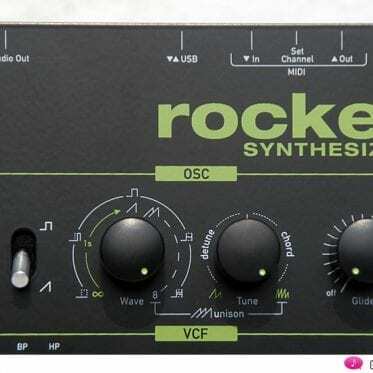 Simply one of the best sounding synthesizers ever. Modern polyphonic analog synthesizers don’t sound the same! They have their own musical qualities and their own legitimation. But they sound different – straighter, more direct, more transparent. The OB-8, however, is like a wild animal. Untaimable. 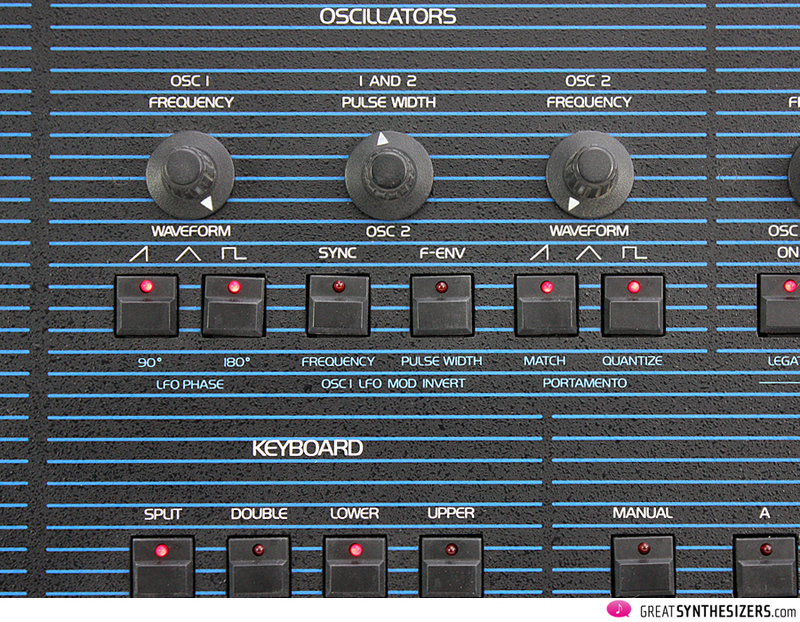 The last of its kind with that famous L.A. Sound that gave Oberheim the world-famous reputation as producer of organic-sounding / massive-sounding instruments. Surprisingly, the OB-8 also features advanced technology. 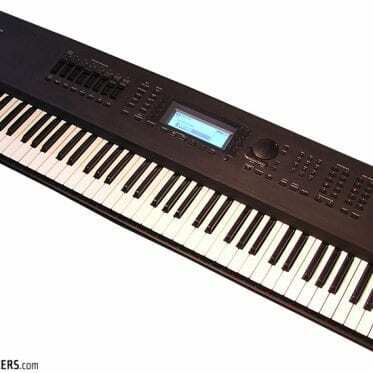 120 memories, light-weight, a pleasant keyboard, acceptable technical reliability, MIDI, advanced (PAGE 2!) functions. Soundfiles: It’s all OB-8, with the exception of the drums (Korg Minipops 120, Roland TR-808) and various synthesizers in the “Mix” soundfile (including the Korg M1 with its distinctive “Lore” sample). 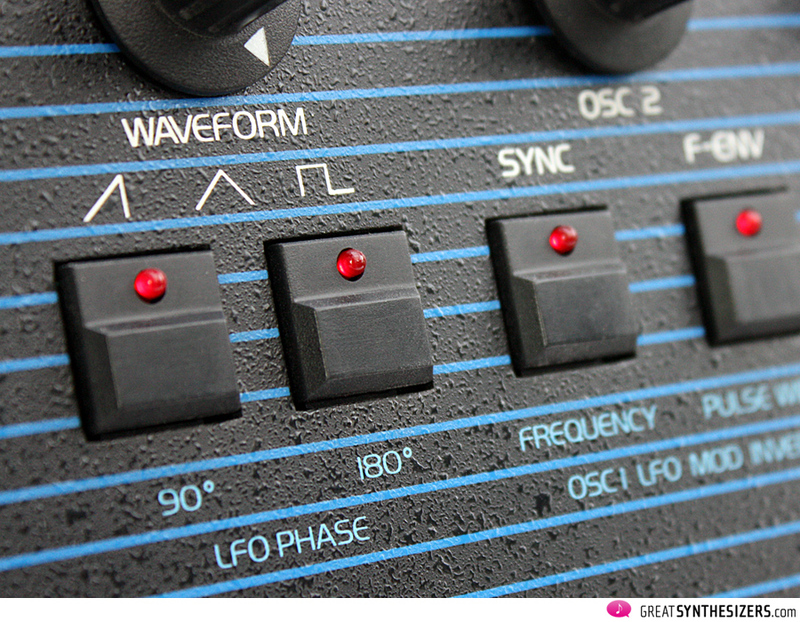 And an external (high-frequency) LFO was used in the “Filter FM” soundfiles to get those special vocal sound effects. Enjoy listening. I have an Elka synthex and a Jupiter 6 and I also would like to get a ob8. What’s your opinion on the ob8 complementing what I have. I really like the sound but I am not sure if it really justifies. I can get one for 3400e. Thank you soo much for your answer. 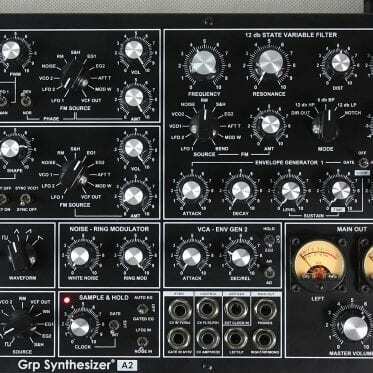 Great write up on this monster of a synthesizer. I found this while trying to get a better understanding of page 2. Im curious as to why in the world the model we have has no light blue labels for page 2. As if it wasn’t confusing enough…. I don’t agree that Jupiter-6 or Synthex are highly precise analog synths. They belong to the same high-end category with the OB-8, in the terms of hardware/sound with a lot of modulations. They are classic (Analog) CEM vintage synths. 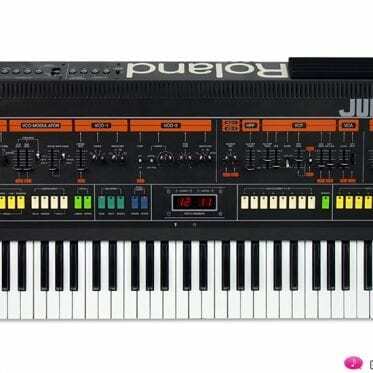 Also I cannot compare the Jupiter-8 with the OB-8, because they have completely different architecture. Hello Jonathan. Technically speaking, you are right. 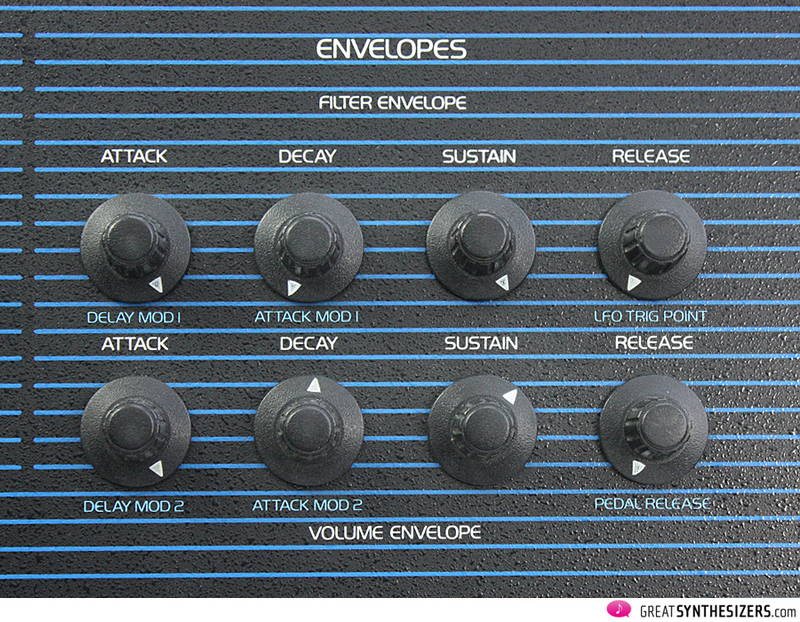 They belong – more or less – to the same classic polyphonic CEM synth category. From a musician’s point of view, though, Jupiter-6 / Jupiter-8 (late version) / Synthex sound a lot more precise than any synth of the OB-series. Their tuning is really stable, their oscillators drift only little. Sure, evaluation of synthesizers and their individual sound depends on your very own musical needs. So there are many different point of views … thankfully.